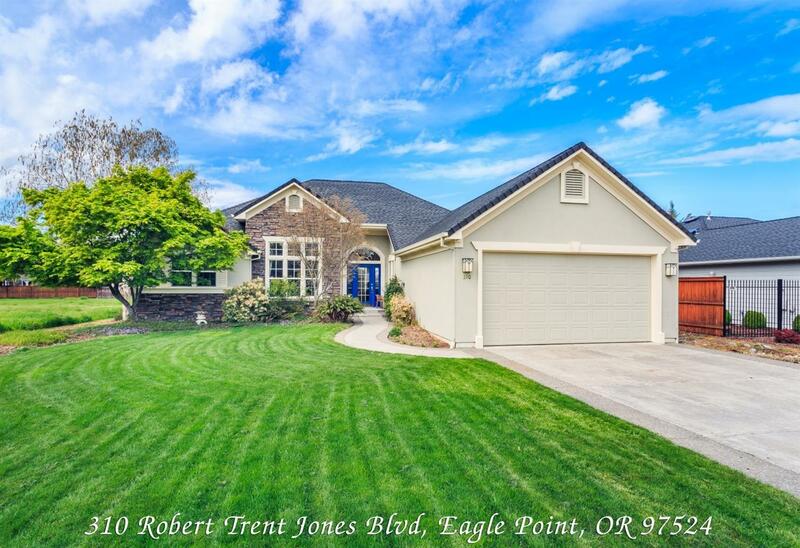 One owner home in the Eagle Point Golf Community. Built in 2001 to be safe and easy to get around in with wheelchair wide hallways and most doorways. Two large bedrooms with walk-in closets. Third front bedroom has an armoire closet. Large master bath with walk-in shower and extra-large tub. Appliances include: Refrigerator, washer & dryer, dishwasher, microwave and 5 burner gas stove. Nice roomy garage with storage shelves and an electrical outlet for charging your electric car (Tesla) 3D virtual tour available online, Osmo and drone video available. Home inspection available online. HOA fees are $78 a quarter and cover, common area landscaping, water, insurance and management fees. Must come tour! Directions: From Highway 62 turn onto S Shasta Ave, then right onto Alta Vista, turn left on to RT Jones Blvd, home will be on the left side.